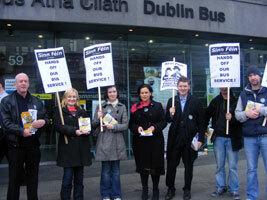 DUBLIN Sinn Féin held a day of action in support of Dublin Bus and its workers last Saturday over proposed cuts in jobs and services. Dublin Bus is planning to lay-off 160 drivers on probationary contracts, make a further 110 drivers redundant and cut a number of buses from routes around the city. The day of action began outside the Dublin Bus HQ on O’Connell Street in the city centre at 12.30 and was launched by Sinn Féin Vice-President and Dublin MEP Mary Lou McDonald. “The decision to withdraw 120 buses from the capital city’s public transport service is incomprehensible, particularly in the context that it is happening under the Green Party’s watch. Mary Lou McDonald described the Government’s inaction on the issue as “shocking but not surprising”. And she explained why. “Let’s not forget that Dublin’s dependency on car usage has been created by decades of bad public transport policy and under-investment by Fianna Fáil. Dublin should have a first-class public transport system that is the envy of Europe. We don’t and this is because successive Fianna Fáil governments have been short on vision, leadership and a real commitment to Dublin’s commuters and businesses alike. McDonald called on people to look at Eircom’s failure to deliver broadband around the country and the negative impact of privatisation on our health service. She asked people to make their voices heard by demanding that the cuts in Dublin Bus be reversed. Sinn Féin are also demanding that the Government deliver sustainable integrated public transport for the people of Dublin who deserve better than what they are currently faced with. 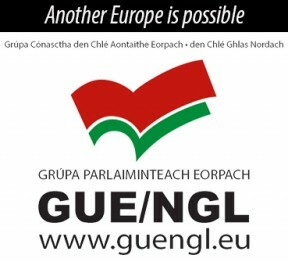 Nearly every area in Dublin mobilised for the day of action co-ordinated by the Dublin Sinn Féin Campaigns Group, with thousands of people showing support for the action and particularly good turnouts in Dublin North-East, and Dublin South-Central. Local Sinn Féin activists reported that the reaction of the public was very positive with huge numbers supporting the bus drivers and their actions, particularly in areas that will be most seriously affected by the cutbacks on bus routes. Activists said that older people especially were deeply angered by the cutbacks on their bus routes. Strike action had been scheduled by bus drivers over the weekend but was cancelled after Dublin Bus management agreed to engage with the trade unions SIPTU and the National Bus and Rail Union (representing the drivers) on their cost-cutting plans. Dublin Bus have now agreed to postpone their cutbacks to allow for talks to begin at the Labour Relations Commission next week. Dublin Sinn Féin are planning to continue their campaign for better bus services, which includes leafleting local areas and collecting petitions, keeping issue on the political and social agenda.